Bertil was born 28 February 1912 at Stockholm, as the fourth of five children born to Princess Margaret of Connaught and Crown Prince Gustaf Adolf of Sweden. His siblings included: Prince Gustaf Adolf, Duke of Vasterbotten, Prince Sigvard, Duke of Uppland, Princess Ingrid and Prince Carl Johan, Duke of Dalarna. The family lived in apartments at Stockholm Palace in Stockholm, at Ulriksdal Palace near the capital in Ulriksdal and at the summer residence: Sofiero Castle in Helsingborg in the southernmost province of Sweden, Scania. Prince Bertil was granted a very old dukedom, one that was bestowed in the Middle Ages on various Danish and Swedish royal relatives, such as Benedict, Duke of Halland. After his eldest brother, Prince Gustaf Adolf, died in 1947, leaving an infant son, Prince Carl Gustaf, in the line of succession, and because his elder brother Sigvard had already given up his place in the succession (owing to a constitutionally unacceptable marriage), it seemed likely that Bertil could one day become regent. After Carl Gustaf became King, Bertil remained the next in line to the throne (until the birth of Princess Victoria in 1977 and Prince Carl Philip in 1979), and continued to act as the King's deputy. When the Act of Succession was changed in 1980, rights to the throne was restricted to Carl XVI Gustaf and his descendants; however, a special addendum was made for Bertil's case, so that he became third (and, after the birth of Princess Madeleine in 1982, fourth) in line to the throne. Bertil became a naval officer; and, during the Second World War, he served as Swedish naval attaché at the embassy in London. In 1943, Bertil had met his long-term partner, Welsh commoner Lilian Craig. However, in order to preserve his place in the royal succession, Bertil and Lilian did not marry for decades. They lived together discreetly, as a fully private arrangement, from the 1940s until their marriage was announced and took place in 1976. Their common base was a home in Sainte-Maxime, in the south of France. Since his life with Craig was not official, Prince Bertil's single status meant he was suggested as a match for, among others, Princess Margaret of the United Kingdom. After the death of Gustaf VI Adolf in 1973, the new king, Carl XVI Gustaf, married a non-royal woman and approved the marriage of Bertil and Lilian, which took place at Drottningholm Palace on 7 December 1976. Lillian then was made HRH Princess Lilian, Duchess of Halland. She died in 2013. Bertil was fond of cars, owning a rare Aston Martin DB2  and a Chevrolet Corvette. Volvo asked him to open the Volvo Halifax Assembly plant in 1963 in Nova Scotia, Canada. A parking garage in Sainte-Maxime is named after him. Prince Bertil was a keen supporter and practitioner of various sports, notably tennis and boules. 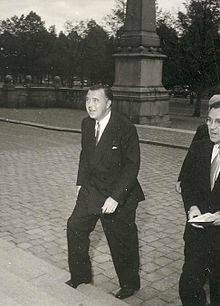 In 1947, he was elected Chairman of both the Swedish Sports Confederation and Sweden's Olympic Committee. He was also a member of the fine-dining society La Chaine des Rotisseurs. He died at his home the Villa Solbacken in Stockholm in 1997, with Princess Lilian at his side. His remains were buried at the Royal Cemetery in Haga Park. Bertil was styled as "His Royal Highness Prince Bertil of Sweden, Duke of Halland". On his creation as Duke of Halland, Prince Bertil was granted use of a coat of arms based on the Arms of Dominion of Sweden, with the arms of Halland in the third quarter. ^ "Queen Ingrid of Denmark". Daily Telegraph. 8 Nov 2000. ^ "HRH Princess Lilian of Sweden". Daily Telegraph. 10 Mar 2013. ^ "H R H The Princess Margaret". Daily Telegraph. ^ Williams, Amanda (11 March 2013). "British-born 'secret' Princess Lilian who kept her romance with Swedish royal hidden for 33 years dies at 97". Daily Mail. Retrieved 15 January 2016. ^ "Originally the property of HRH Prince Bertil of Sweden 1952 Aston Martin DB2 Drophead Coupé". Bonhams. ^ "Restoring HRH Prince Bertil of Sweden's Corvette". GM Heritage.